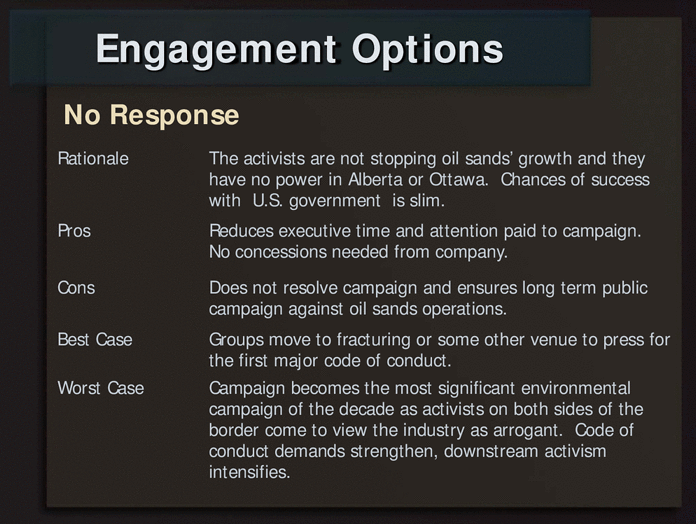 The oil industry never wanted people to get worked up about the tapping of Canada's tar sands. That much already went without saying. But a 2010 presentation released by Wikileaks shows just how desperate it was to keep to environmentalists off its back -- and just how unsuccessful, three years later, it's been in doing so. InsideClimateNews calls the presentation "the latest in a series of revelations that suggest energy companies—which for most of their history seemed unfazed by activists—have been looking for ways to dilute environmentalists' growing influence." National Journal calls it silly. But both agree that, as thousands of people "on both side of the border" have joined in protests against the tar sands, the oil industry's worst case scenario has come to pass.